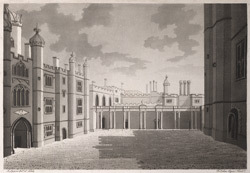 View of the North Front of the Second Principal Court or Inner Court at Hampton Court Palace. The Palace, as its name suggests, was built around a series of courtyards and the Inner Courtyard was surrounded by the more official rooms such as the Great Hall. It was also bordered on the east side by the private apartments of Cardinal Wolsey and the suite of rooms for the King and Queen. For three centuries Hampton Court was a favourite Royal residence but the palace had ceased to be used by George III and his family in the later eighteenth century.